With its Galaxy S8 line out the door to much fanfare, Samsung's attention is now turning to its virtual reality ambitions. And "ambitious" sounds like just the word to describe them, going by comments made by a marketing executive at the company. Speaking to CNET, Samsung's executive vice president of global marketing for Samsung mobile, Lee Young-hee, confirmed that a powerful standalone headset is "still under construction" at the company. 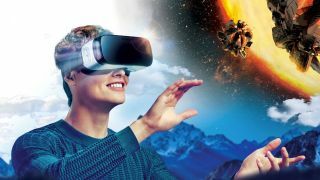 Aimed at "media producers and pro gamers", Samsung's aspirations seem to be set on taking on the likes of HTC Vive and PlayStation VR, using its partnership with Oculus to take mobile VR to the next level. It's not yet certain if the device in question will be tethered to a PC or fully mobile, or have capacity to work in both situations, but it's thought that the headset is the same as was shown off behind closed doors at this year's MWC, making use of the new 10nm Exynos 9 mobile chip. That Samsung has such confidence in its new mobile processors is telling in terms of just how far they've come. This is likely the 'Odyssey' project that Samsung has been linked to, building out Samsung's VR and gaming aspirations. Not that Samsung is doing badly in the space already – the Gear VR is already in the enviable position of being the best-selling of all current virtual reality headsets. Samsung's in a great position to build on this success.